If you have picture frames and photo albums with oddly sized pages and you've been burning through your 4x6 photo paper trying to get it right, I have good news for you: PhotoSheet supports custom layouts! There have been a few other minor improvements - for instance, it's easier to rearrange the images on a sheet; just click the image in the preview picture and it'll be selected in the list. You can also drag-and-drop the images in the preview to rearrange them. Or use the Recompose feature to zoom and reposition individual images. Click here to learn more about those capabilities. This page will explain some of the features that enable you to customize the layout and paper size, and create your own layouts and sheet sizes. Here's a screen shot from the Windows XP version of PhotoSheet, showing one of the custom layouts (a 4x6 sheet containing a pair of 2.5 x 3.5 pictures, perfect for those small picture frames). In the Sheet Size section I've added several common paper sizes to the list. To simplify the list the "Vertical" checkbox can be used to flip the page between horizontal and vertical orientations. If the shet size you're looking for isn't available, scroll down to learn how to add a custom sheet size. In the Layout section, the "Flip" checkbox can be used to flip the layout between horizontal and vertical orientations, independent of the paper orientation. Watch the preview area carefully - if what you see isn't what you're looking for, you can try changing these two checkbox settings (Vertical and Flip) to find the layout you like. The content of the drop-down list in the Layout section is the most interesting new capability of PhotoSheet. 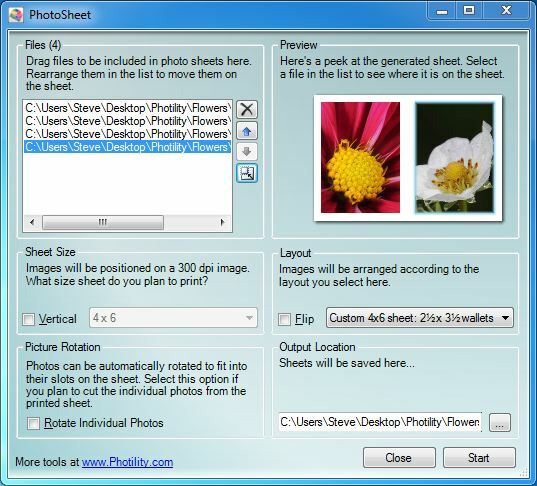 There are numerous "grid" layouts that arrange many photos on a sheet (any size sheet). I use these for those collage picture frames in my house that just don't seem to have enough 4x6 openings. This way I can cram more photos into one of the 4x6 openings. There are several "collage" options that are similar and more creative. There are also a few "wallet" options that you can use to create wallet images on your 4x6 photo printer. These are designed to create very specific-sized images and assume you are printing on a 4x6 sheet. If you're printing to a 5x7 or 8x10 (or larger) printer, you can create your own custom layouts for those (keep reading...). Download new layouts from Photility, which will be added to this list (these layouts typically begin with "Photility"). Add new custom layouts of your own (keep reading for how to do this). Refresh the list (do this after you edit the custom layouts). If you come up with a great layout, send it my way and I'll make it available to everyone through the Photility collection. And since I occasionally add more layouts to the Photility collection, you might occasionally choose this option to get the latest set. Be careful editing the Photility layouts file - this file will be replaced the next time you do the "import from Photility" operation and your custom layouts would be lost. Use this file for ideas, and put your custom layouts in the Custom Layouts file. If you mess up anything in the Custom Layouts file, you can delete the file and PhotoSheet will re-create the default custom layouts the next time you start the app (or use the Refresh option). When you're done editing and saving the custom layouts files, return to PhotoSheet and use the Refresh option to re-load the layout list. Your newly edited layouts should appear in the list. On Windows 10 and the Mac, things are slightly different. Additional Photility Layouts are delivered through the App Store. And you won't find the "Edit Custom Layouts" option in the list. On Windows 10, the ability to import custom layouts is planned for a future update. Press Command-Space to bring up the Spotlight Search window. Edit the file using TextEdit (or another editor of your choosing). Quit and re-load PhotoSheet. It will look for the xml file when it starts up. Adding your own custom layouts or sheet sizes is easy. The XML might be a bit intimidating but if you're careful you can do anything. If you need to, get some help from a friend who has built a web page; XML is very similar to HTML. 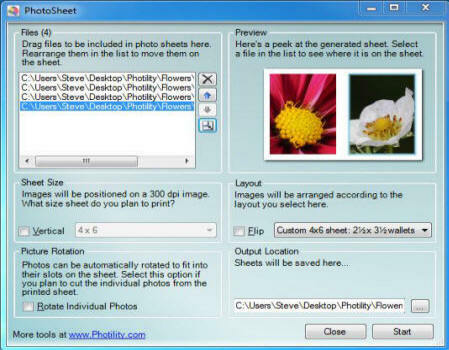 Each PhotoSheet sheet size is described in a "<sheetsize>" element, which has a couple of attributes that provide the name and size. The name attribute will appear in the list of sheet sizes in the app. Each PhotoSheet layout is described in a Layout element, which begins at "<Layout" and ends with "<Layout/>". Each layout has a couple of attributes. The first attribute, size, is optional. The first number is the horizontal dimension, and the second number is the vertical dimension. If you pick a page size that doesn't exist in the Sheet Size list the size will be added to the list. Follow the example above and you'll be fine. For instance, size="5x7" would describe a 5" by 7" sheet oriented vertically. The second attribute, name, is required. This is the name of the layout and it is displayed in the Layout list in the user interface. The third attribute, padding, is optional. If it's omitted, it's assumed to be zero as in the example above. Padding is a number between 0 and 100, and represents a percentage of the allowed range of image padding. At 0, each image will be rendered to fully fill its rectangle. At 100, the image will be scaled down inside its rectangle, leaving empty space around it. Padding is supported starting with version 1.0.0.13 of PhotoSheet, and is explained in more detail here. The fourth attribute, rounding, is also optional. If it's omitted, it's assumed to be zero as in the example above. Rounding is a number between 0 and 100, representing a percentage of the allowed range of corner rounding. At 0 the image has a square corner, and at 100 the image has a round corner. Rounding is supported starting with version 1.0.0.13 of PhotoSheet, and is explained in more detail here. Within each Layout element are one or more Rectangle elements, and each rectangle corresponds to a slot on the photo sheet into which a photo will be inserted. Each element has 4 required attributes and they can come in any order: right, bottom, top, left. Each attribute describes the location of an edge of the rectangle. The numbers are percentages of the width or height of the overall sheet. So the first rectangle in the above example would be described as having a bottom edge that is 93.75 percent of the distance from the top of the sheet to the bottom of the sheet. Its right edge would be 45.84 percent of the distance from the left edge of the sheet to the right edge of the sheet. And so on. You can see the "<layout>" element with its name attribute. The size attribute is optional and is omitted because this layout is intended for all page sizes. There are three "<rectangle>" elements. All three rectangle elements have the same value for their top (0 percent of the distance from the top of the sheet to the bottom), and bottom (100 percent of the distance from the top of the sheet to the bottom). This is good; we want them to stretch the full height of the page. The left and right attributes for each rectangle show that each rectangle gets 33 percent (1/3) of the width of the page, and the left and right edges of each rectangle are progressively 33 percent to the right of the previous rectangle. Phew. Hopefully that made sense. If you come up with any handy layouts, send them along and I'll update the Photility layout collection for all to enjoy. Meanwhile, I hope you enjoy the feature.